The county does have a role in creating the proper environment to attract and keep business. 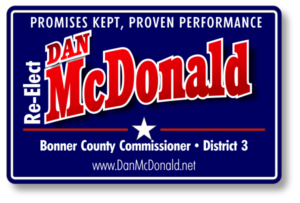 I will continue to work toward a friendly and productive business environment in Bonner County, not just to attract new business but to retain businesses that are already here. While I am for growth as I believe it would create more and better paying jobs for our citizens, I am also for the right kind of growth so as to not conflict with the natural beauty and resources we all enjoy.